This rule of 78 calculator can be used to provide the rule of 78 calculation interest expense for any period in the term of a loan up to a maximum of 600 periods. The calculator will also produce a loan amortization schedule setting out for each period, the beginning loan balance, the interest expense and repayment for the period, and the ending loan balance. The Excel rule of 78 calculator, available for download below, is used to produce an loan amortization schedule by entering details relating to the loan principal, the periodic repayment, and the number of periods in the loan term. Enter the principal loan amount. Enter the loan repayment. This is the constant loan repayment made at the end of each period throughout the term of the loan. Enter the loan term. This is the number of periods in the term of the loan. A period can be any term (month, year etc). The interest expense will be calculated for this period. For example if a loan has a 12 month term the term is entered as 12 then the expense will be for each month, if the term is entered as 3 years, then the depreciation expense will be calculated for each year. Enter the period for which the rule of 78 interest expense is required. For example, if the interest expense for period 3 is required enter 3. The rule of 78 calculator works out the interest expense for the period entered in step 4. In addition, the calculator provides a rule of 78 loan amortization schedule setting out for each period, the beginning loan balance, the rule of 78 period interest, the period repayment, and the ending loan balance. The Excel rule of 78 calculator, available for download below, will calculate the interest expense for any loan with a maximum term of up to 600 periods, and is used by simply entering values for the loan principal, periodic repayment, and loan term. Users use this rule of 78 loan calculator template at their own risk. We make no warranty or representation as to its accuracy and we are covered by the terms of our legal disclaimer, which you are deemed to have read. 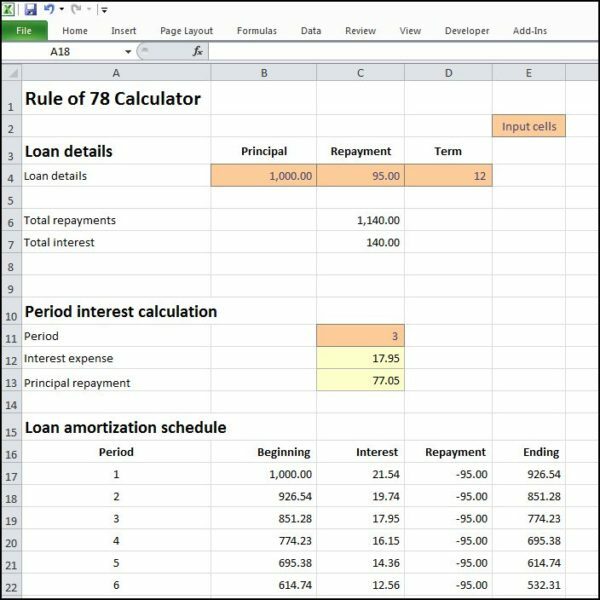 This is an example of a rule 78 calculator with loan amortization schedule that you might use. It is a purely illustrative rule of 78 refund calculator. This is not intended to reflect general standards or targets for any particular company or sector. If you do spot a mistake in the rule of 78 calculator excel, please let us know and we will try to fix it.